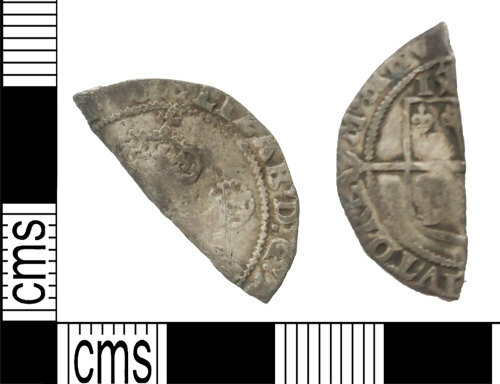 Incomplete silver post-medieval hammered shilling of Elizabeth I, dating to 1582 - 1599 AD. Fifth issue. The coin has broken in half. Obverse of left-facing bust wih rose behind head; [..]ELIZAB D G. Reverse of square shield on long cross fourchee with date above shield; IVTORE/M MEV[..]. All that remains of the date is 15. The coin is 25.0mm in length, 11.8mm in width and 0.7mm in thickness. It weighs 1.16g.